Titan Fitness produce both commercial and home exercise equipment. Their success comes from the high quality of their products, and also the clever designs they have created. When it comes to Titan dumbbells, you can’t go wrong with a pair. I would have different recommendations for different users, but overall there is a great Titan dumbbell available for every type of user. Titan are a trusted and very well known brand. They’ve been around for many years already, perhaps even decades at this point. Keep in mind that there is a lot of variation on their designs. You can get standard dumbbell handles complete with cast iron plates. These are the original type of dumbbell which use spinlock collars to fix whatever plates you like in place. It gives a lot of variability because you can do anything from an empty bar up to a fully loaded dumbbell. These are usually a great choice for home users because you can alter the weight anytime. Another advantage of the old-school basic design is the simplicity of upgrading. You can start off with a pair of bars and a couple of light plates. As you get stronger and your needs increase, it’s easy to just buy more plates and put them on when needed. There are only a couple of different bar designs available, which have slightly different lengths and weights. Outside of that, they can both be loaded up quite heavily with any plate that fits, not just Titan weight plates. 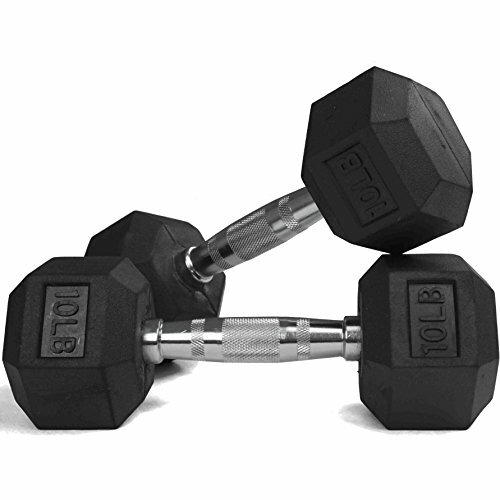 One alternative style which Titan created for home users is the Titan adjustable dumbbell. 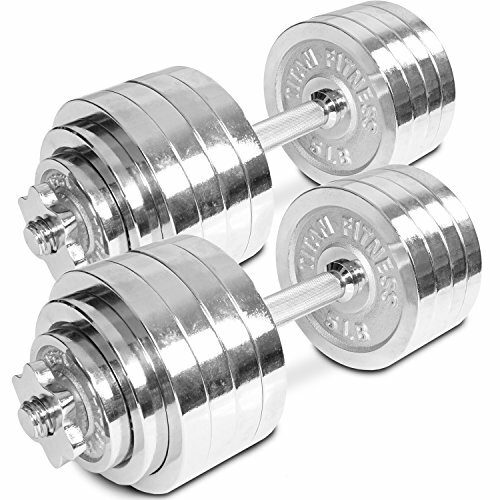 This is a chrome dumbbell package in bar & plate style. The set is comes with two bars that are both fitted with a ‘complete’ set of chrome weights, allowing for easier storage and a better look. Many home users prefer this look to the more plain black plates. Then there are also the hexagonal sided, rubber-coated dumbbells. These can’t be changed in weight. Each side has a moulded, rubber coated weight which can’t be detached from its handle. The rubber sides protect floors, walls and any other surface from damage caused by hard metal edges. Keep in mind these can still be very heavy and easily break into a wall or floor, but without sharp corners issues like minor scratches and scuffs are easily prevented. On the other hand you need a lot of different weights with this design, one set for each weight you want to use, and more than likely a rack to store them in. The hexagonal design keeps these from rolling around the floor or rolling off a rack, so it’s helpful in terms of safety as well. For a gym that can be a great set-up. Safer equipment which doesn’t have to be adjusted or set-up in any way. Just grab a dumbbell and get on with your exercise. On the flipside, for a home user the cost can add up quickly to try and get a fully usable set. Plus it takes up a lot of space too, so the rubber moulded versions are only recommended for commercial users. Many brands of plates can be used. With a brand like Titan a big advantage is having the different products available for different uses. 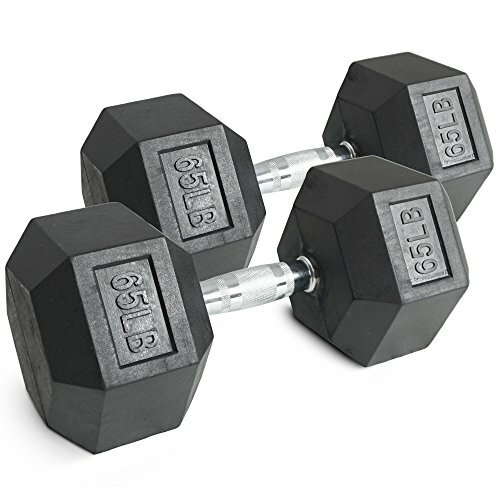 For example, for commercial users there are a wide variety of rubber capped dumbbells. These are great because they’re a one-piece unit and are safe to use. 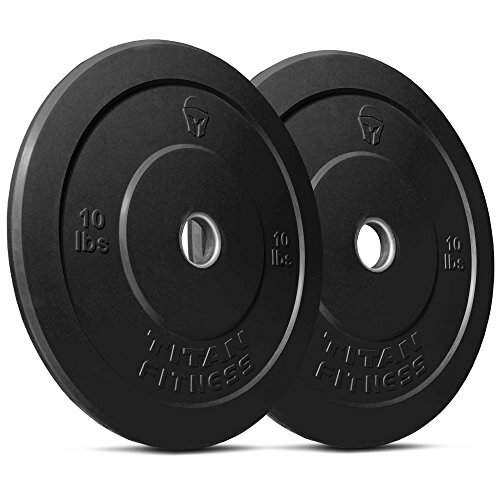 These are a great option for people wanting a variety of safe and easy to use weights. They stay in place thanks to the hex-shaped ends and don’t cause much damage, even if they end up needing to be dropped suddenly your floor is likely to survive. Then there’s the smaller weights which are completely rubber coated and come with a small stand, each loaded with a few pairs of light dumbbells. A good looking and user-friendly set with plenty of comfort. This is ideal for aerobic type workouts and people who are focused on toning, because they’re only available in lighter weights. Finally of course there’s the heavier, adjustable dumbbells. Like the rubber-capped versions, these are useful for any and all workout goals. You can train light, heavy or in between because they can be adjusted. This is a perfect set up for home training. You can keep a stack of weights neatly tucked away and add/remove them to the dumbbell as needed. Each version dumbbell is also user-friendly. The rubber capped type is safer for your floors/walls and has well-shaped handles that come with a grippy surface. That helps to keep the weight from slipping out of your grip. The full rubber design is very ergonomic and comfy on the hand, it still has decent grip but the lighter weights don’t need this as much. Instead the focus here is on comfort and keeping your hand skin protected and smooth. Depending on which model you choose, you will either have convenience or adjustability. The rubber versions give convenience. 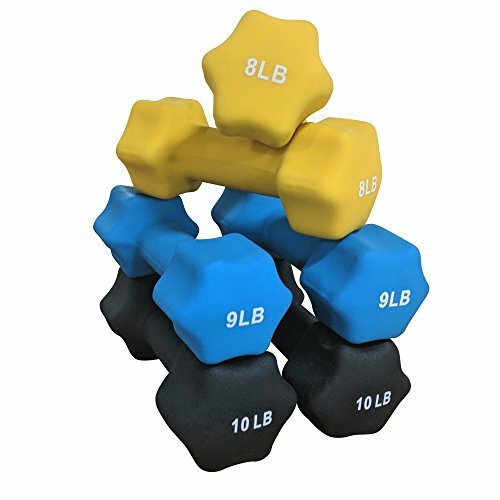 This option gives you a rack of dumbbells to choose from, so if you want to change weight, just put your pair back and choose the ones which are right for you. Also they don’t roll around or away when put down because they have a hexagonal shape. The alternative is the adjustable version. This one lets you go as low or as high as you want to in weight (within reason). It’s a great option for people who might regularly switch between multiple weights and don’t have much space. There is some convenience here, in a space-saving way. Using plates means you don’t need as much space. You can keep a good collection of universal plates without needing much room, ideal for a home user. Titan are an old and very reputable brand. Their equipment is found in plenty of gyms and homes around the country. This is because it’s very durable. The weights don’t wear easily, neither do the dumbbells. All versions will stand the test of time and be perfectly usable years down the line. I mentioned earlier that depending on which type of Titan dumbbell you choose, you’ll either get adjustability or convenience. Of course that means either way, you will also get a drawback. With the rubber versions a lack of convenience is your drawback. You need multiple dumbbells at different weights so you can swap between them (unless you can do your training with only one set weight?). This also means you need the space to store the extra dumbbells. Alternatively you can use the adjustable version. This means no limits, you can go as high/low as you like. Of course that also means buying more weight plates and taking time to unscrew the collar and change over plates before you can actually use the dumbbell again. Storing plates saves a lot of space compared to having a lot of dumbbells. It works out cheaper too, but along with changing the weight, you also have to deal with hard, round, iron weight plates. These can mark floors/walls etc. easier than the rubber coated versions. This means you really don’t want to drop them or bang into anything, and the rounded shape means they can potentially roll away when on the floor too. These dumbbells can also be damaged over time. Titans’ metal plates are a little prone to rust but otherwise very sturdy. Their shape/design makes it easy for these to cause damage on walls/floors if they bang into them though, especially walls as the flat/sharp edges of the bar/plate can easily catch a wall when walking past. On the capped/coated versions, the rubber is likely to split if not properly looked after. This can happen when weights are thrown, dropped or not stored correctly. Once the rubber splits, it’s usually only going to get worse, and can also cause an imbalanced dumbbell. Going the adjustable route? You will eventually need to buy more plates. The one advantage here is that you can use the same plates for all barbells/dumbbells if you buy bars that are the same size. Choosing the non-adjustable versions? Well, now you have to buy multiple dumbbells. A complete set in every weight, like a gym would have, can cost a huge amount of cash! The price alone here is very off-putting to most people. Overall Titan make great dumbbells in any style. You really can’t go wrong with their models. The big decision that you need to make is whether to buy an adjustable version or a rubber capped one. 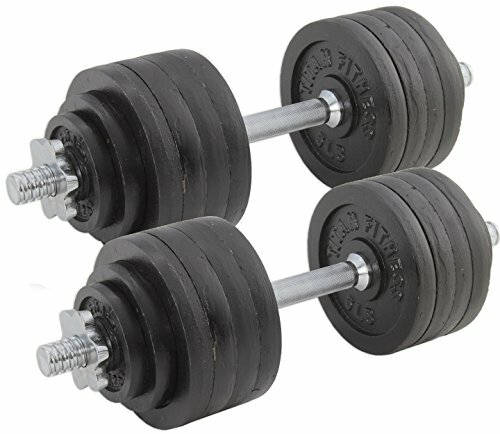 If you are using light weights only then I would recommend a small stand complete with a few different dumbbells, all the complete rubber-coated version, these are very comfortable to use. For those needing heavier weights, I would recommend an adjustable dumbbell. It’s cost effective because you use the same plates for other exercises. Rubber-capped versions, which have to be bought in individual pairs only and require a separate stand, are better for those who can afford any budget, or business buyers. I have been involved in sports and fitness since childhood, representing my high school in rugby, athletics and cross-country. In college my focus turned to weights and football (soccer), alongside athletics again. Through adult-hood I have tried many forms of training including BJJ, MMA and yoga whilst also continuing to develop general fitness at the gym (weights, circuits, cardio). I've also got a decade of Muay Thai experience including a gold medal at 2016's Unified World Championships, representing my national team at light-welterweight. Additionally I take part in endurance events and starred on Channel 4's TV show "SAS: Who Dares Wins" which is a condensed version of British special forces selection. My focus these days is on fitness, mental health and fundraising via extreme physical challenges.